How to Replace Brother DR110CL Drum Cartridge on Brother HL-4040CN | TonerGreen - Eco-Friendly Toners from the U.S. 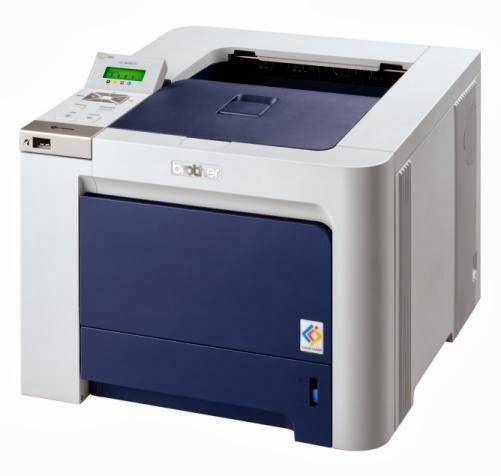 The Brother HL-4040CN is a color laser printer with networking features via its built-in Ethernet network interface that enables multiple users to share the printer with everyone on the same network. It has a printing speed of up to 21 pages for monochrome and colored printouts so you can “quickly and cost effectively produce presentations, reports, brochures or documents.” It delivers vibrant color documents with its printing resolution of up to 2400 x 600 dpi to produce color documents with sharp text and brilliant graphics. For today’s article, we’re going to give a simple maintenance solution to printer users who own a Brother HL-4040CN laser printer. These steps refers to how they should replace their Brother DR110CL drum cartridge on the Brother HL-4040CN laser printer properly so they wouldn’t need to ask for any assistance on the printer’s tech support the next time. button and then open the front cover. Step 2 - Hold the green handle of the drum unit. Lift the drum unit up and then pull it out until it stops. Step 3 - Release the gray lock lever (1) that is on the left side of the printer. Pull the drum unit completely out of the printer using the green handles on the drum unit. Step 4 - Hold the handle of the toner cartridge and pull it out of the drum unit. Repeat this for all the toner cartridges. Step 5 - Unpack the new drum unit and remove the protective cover. Step 6 - Hold the handle of the toner cartridge and slide the toner cartridge into the drum unit. Make sure that you match the toner cartridge color to the same color label on the drum unit, and make sure that you fold down the toner cartridge handle (1) once the toner cartridge is in place. Repeat this for all the toner cartridges. Step 7 - Put the drum unit back in the printer as follows. Step 8 - Close the front cover. After you have replaced the drum unit on your printer, the next thing you need to do is to reset the drum counter through following these steps: (1) turn the printer power switch back on, (2) press the + or - button to choose "Machine Info", (3) press OK to proceed to the next menu level, and then press the + or - button to choose "Reset Parts Life", (4) press OK, and then press the + button to choose "Drum Unit" and lastly, (5) press OK two times. After these, you can now continue printing your documents.